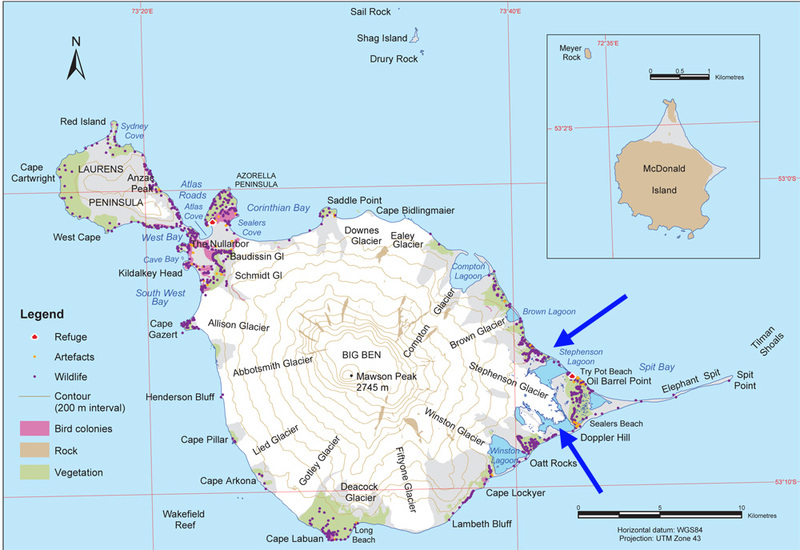 The Australian Antarctic Division manages Heard Island Island and has undertaken a project documenting changes in the environment on the island. One aspect noted has been the change in glaciers. The Allison, Brown and Stephenson Glacier have all retreated substantially since 1947 when the first good maps of their terminus are available. Fourteen Men by Arthur Scholes (1952) documents a year spent by fourteen men of the Australian National Antarctic Research Expedition that documented the particularly stormy, inclement weather of the region. Their visit to the glacier noted that they could not skirt past the glacier along the coast. After crossing Stephenson Glacier they visited an old seal camp and counted 16,000 seals in the area. It is a rich area for wildlife, that should benefit from the lagoon formation overall. Thost and Truffer (2008) noted a 29% reduction in area of the Brown Glacier from 1947-2003. They also observed that the volcano Big Ben that the glaciers all drain from has shown no sign of changing geothermal output to cause the melting and that a 1 C warming has occurred over the same time period. Stephenson Glacier extends 8-9 km down the eastern side of Big Ben. In 1947 it spread out into a piedmont lobe that was 3 km wide and extended to the ocean in two separate lobes around Elephant Spit. 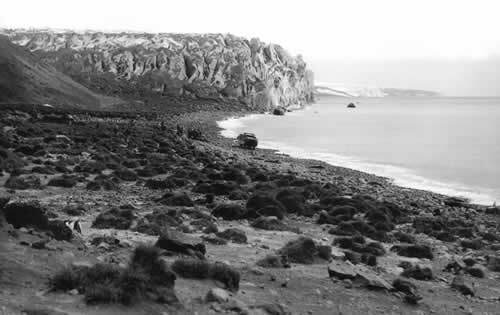 A picture from the Australian Antarctic Division taken in 1947 shows the glacier reaching the ocean and then in 2004 from the same location. Kiernan and McConnell (2002) identified an order of magnitude increase in the rate of ice loss from Stephenson Glacier after 1987. Retreat from the late 19th century to 1955 had been limited. As Kiernan and McConnell observed retreat began that by 1971 the glacier had retreated 1 km from the south coast and several hundred meters from the northern side of the spit. This retreat by 1980 caused the formation of Stephenson Lagoon and by 1987 Doppler Lagoon had formed as well. After 2000 the two lagoons have joined. The first image below shows the terminus locations over the last 60 years from the Australian Antarctic Division 1947-2008. Here we examine a series of Landsat images from 2001 to 2013 to update the response of this glacier. In 2001 the glacier has two separate termini, pink arrows,in two different lagoons, Doppler to the south and Stephenson to the east. There are numerous icebergs in Doppler lagoon but none in Stephenson Lagoon, indicating the retreat is underway. In 2008 the two lagoons are well joined, icebergs are even more numerous obscuring in this view the true location of the terminus, orange arrows. 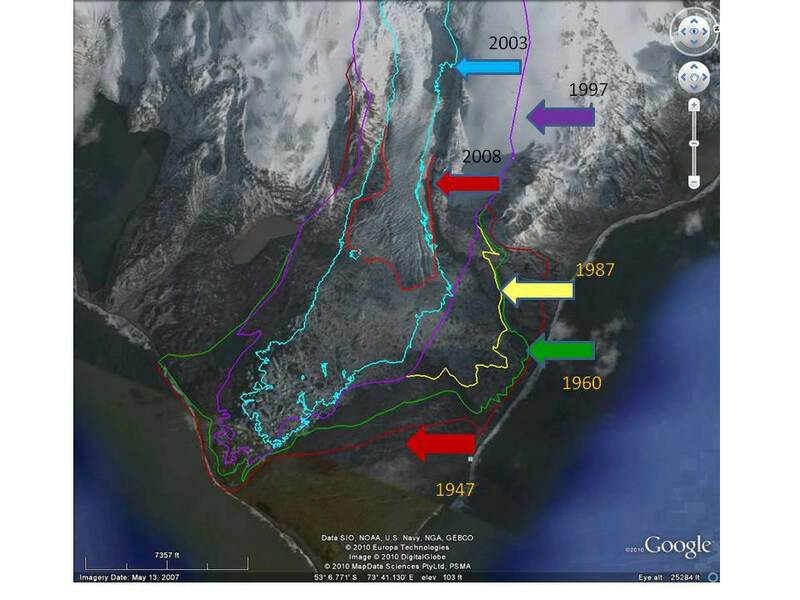 By 2010 the glacier has retreated from the main basin of the lagoon, and is at red arrow, and the lagoon is free of ice for the first time in several hundred if not several millenium. In 2013 the glacier has retreated into a narrower valley that feeds into Stephenson Lagoon. The northern arm of the glacier experienced a 1.7 km retreat from 2001 to 2013 and the southern arm as 3.4 km retreat. The period of rapid retreat due to calving of icebergs into the lagoon is over and the retreat rate will now be slower. There is still rapid glacier flow toward the terminus as indicated by extensive crevassing. The overall glacier slope is steep and accumulation rates high, which would also generate rapid glacier flow. The AAD has a number of images in their gallery of Heard Island glaciers including Stephenson Glacier. The climate station at Atlas Cove indicates a 1 C temperature rise in the last 60 years. The AAD will also certainly be looking at how this new lagoon impacts the local seal and penguin communities. The map above indicates the importance of Stephenson Lagoon for wildlife, king penguins and cormorants are noted by AAD. The retreat of this glacier follows the pattern of glacier retreat at other glaciers on islands in the circum-Antarctic region Cook Ice Cap, Kerguelen Island , Purvis Glacier, South Georgia and Neumayer Galcier, South Georgia. Map of retreat from superimposed on Google Earth image. This entry was posted in afghanistan climate change, climate change glacier retreat, heard island glacier retreat, stephenson glacier retreat, stephenson lagoon glacier retreat. Bookmark the permalink.